Silk Bedding Direct is a UK company with worldwide delivery, and operates at the high luxury end of the mulberry silk-filled bedding market. Our mission is to provide the best of the best when it comes to luxury mulberry silk-filled duvets, pillows and mattress toppers. To achieve this bedding from Silk Bedding Direct's Luxury Range contains only the very finest top grade long-strand 100% natural mulberry silk within its interiors, and specialised processes are employed during its creation. For example, the mulberry silk that comprises the interiors of the silk-filled duvets is hand stretched into the duvet casing and then loop-sewn and tied by hand to prevent movement, thereby creating a more comfortable, lightweight and luxurious duvet. 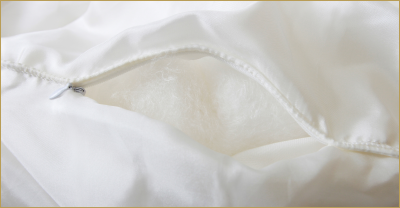 Besides the superior quality of the mulberry silk itself, thermal insulating properties created by air enclosed within the fine silk threads greatly contributes to making Silk Bedding Direct's Luxury Range mulberry silk-filled duvets so light and comfortable, and so effective in regulating sleeping temperature. It is the very same top quality long-strand mulberry silk that is used for the interiors of our silk-filled pillows and silk-filled mattress toppers – providing absolutely top quality mulberry silk-filled bedding. Seemingly small differences and attention to detail like this all add up and Silk Bedding Direct is now widely considered to provide the most luxurious and well-produced mulberry silk-filled duvet on the market today. You can be sure of the best by buying Silk Bedding Direct. Besides the Luxury Range the Premium Range mulberry silk-filled bedding was developed in response to customers requesting a high quality, genuine mulberry silk-filled duvet at a lower cost as compared to our rather high-brow, best on the market, hand-finished, Luxury Range. Many of the best features have been maintained from the Luxury Range - 100% mulberry silk interiors, and the same great attention to detail is paid during their production. The two Ranges offer a choice of prices, and we firmly believe these to be the very best “Price for Quality” for genuine 100% mulberry silk-filled duvets available anywhere. Worldwide delivery options available at checkout. All bedding is OEKO-TEX Standard 100 certified and are complete with the OEKO-TEX “Confidence in Textiles” label. Buy now and receive a free high quality carry and store case for each silk bedding product ordered. Orders are dispatched from the UK on the same or next day. For those of you who are interested, this is how Silk Bedding Direct came into being.... 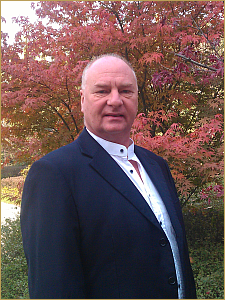 The Director, Andrew Clarke, is an Englishman who has spent over a decade as a director / CEO of companies based mainly around the silk-fields of China, where the very best silk in the world originates. Andrew had slept comfortably under mulberry silk-filled duvets himself for many years and knows first-hand that they are a far superior and more comfortable alternative to down, feathers or wool duvets. Mulberry silk-filled duvets (sometimes referred to as mulberry silk quilts) breathe, allowing excess moisture and heat to escape if you become too warm in bed, but regulate temperature to keep you snug if conditions get colder. Unlike other bedding they are totally clean; dust mites and other microscopic life cannot live in silk. They are also hypoallergenic, delay skin ageing and nourish your hair. And mulberry silk-filled duvets also offer a luxurious soothing comfort not provided by other bedding. In fact Andrew found them to be by far the most comfortable type of high quality bedding he'd ever slept under, and now customers all over the world have repeatedly confirmed this. See list of full benefits. When in the UK and other places in Europe he was surprised to find how little was yet known about these great silk duvets, and how few places he could buy duvets such as these. Looking into it further he found nearly all stores that did sell this type of luxury Chinese bedding were selling an inferior product. In some stores he found the duvet interior was tussah silk, which has to be chemically cleaned due to its low grade quality. He knew that mulberry silk, provided it is top grade, is of such a good quality that it can be used in its natural state with no chemicals or any other treatment required whatsoever, thereby preserving all the silk's great properties. Andrew realised that the superior solution is to produce high quality duvets with silk interiors in the traditional way. That is to use only the very best long-strand mulberry silk and to hand loop-sew and knot tie the silk interior in place through the duvet casing. 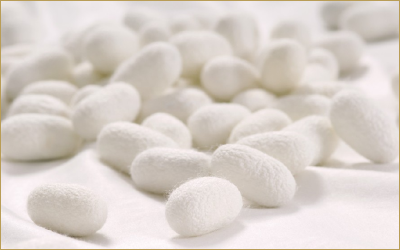 This ensures that the silk remains pure and natural whilst ensuring it doesn't bunch up or move about within the casing. It is ideal as it also maintains the necessary volume of air within the silk interior and keeps all its essential health, beauty and insulating properties. At this point, initially with the help of some of his large array of established contacts within the silk-fields of Zhejiang Province, Andrew's company started to produce mulberry silk-filled duvets to these exacting standards. The result is the Silk Bedding Direct brand and a wonderfully comfortable mulberry silk-filled duvet produced with the very highest quality mulberry silk, hand-finished to perfection with every possible small attention to detail. A silk duvet that provides SBD customers with a luxuriously comfortable and even warmth, and all the additional health and beauty benefits, for years to come. The next step was to expand our luxury silk-filled bedding range to include silk pillows and mattress pads. And more recently to launch our Premium Range 100% Mulberry Silk Bedding. And because there are no middlemen you can enjoy the wonderful benefits of these truly luxurious silk duvets, mattress toppers and silk pillows at a similar price to those of lower quality available elsewhere. Silk Bedding Direct is now well known as the foremost high-end supplier of luxury mulberry silk-filled bedding. You can be sure of the best by buying Silk Bedding Direct. Mulberry silk-filled duvets, pillows and mattress pads are our specialism. We promise you will not be disappointed. Click on the bed size of your choice to find out about the Luxury Range combination sets of wonderfully soft mulberry silk-filled duvets, pillows and mattress pads available in that particular bed size. I guarantee that all products purchased from Silk Bedding Direct are made of high quality materials, produced to international standards and in a way that ensures they are the best in their class in terms of quality and workmanship. In the highly unlikely event that a customer receives a sub-standard or damaged product I will ensure that they are offered either a replacement or a full refund depending upon the customer's preference. I will do my best to ensure every person involved anywhere in the supply chain are paid reasonable wages according to their position and work in safe conditions. I consider it my duty that everyone benefits, from the suppliers of the silk through to the people in the production process to the end user. I am confident that buying mulberry silk-filled bedding from Silk Bedding Direct is good decision making by our customers. For years to come they will benefit from sleeping in much more comfortable bedding of excellent quality, plus all the other health and beauty related benefits. I am also confident they will never want to revert back to any other type of bedding.